Are you a mom returning to work and still nursing your newborn baby? Has your employer refused to provide you with any accommodations to express breastmilk in a private location at intervals throughout the day? 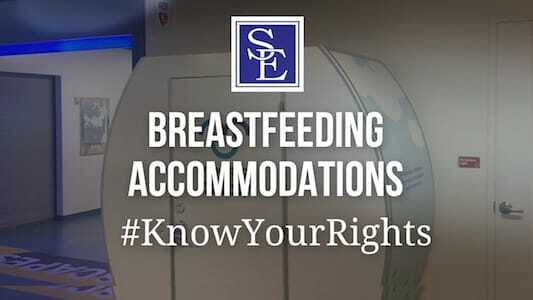 If you are being denied accommodations at work in connection with breastfeeding, you have rights under state or federal law. The New Jersey employment lawyers at Smith Eibeler, LLC regularly advise clients and provide advice and counsel regarding their rights to express breastmilk while at work. The New Jersey Law Against Discrimination prohibits discrimination on the basis of gender and pregnancy. Employer must provide pregnant women with reasonable accommodations at work, such as breaks, medical leaves or job assignments that are less strenuous during the pregnancy. Employers must also provide leave from work to women in order to give birth to their babies and recover. The leave must be the same amount that is provided to disabled employees who need medical leaves of absence. The employer must also provide accommodations to women who return to work who wish to breastfeed their children. This includes providing lactating employees reasonable breaks every day during which they can pump breast milk and designating a suitable private place that is not a bathroom stall, where the employee can pump breastmilk. The designated pumping location must be in close proximity to the employee’s office. It is unlawful for an employer to discriminate or retaliate against an employee for requesting breastfeeding accommodations or expressing breastmilk while at work. While the law states that breaks to express breastmilk must be “reasonable” the law does not further dictate the frequency or length of time an employee make take to express breastmilk. New Jersey breastfeeding law requires that an employer and employee engage in an interactive process to address the employee’s request to breastfeed at work. This interactive process requires both the employer and the employee to act in good faith and communicate with one another concerning the need to breastfeed and possible accommodations that can be made by the employer to the employee for breastfeeding. Unless an employer can demonstrate that providing breastmilk expression accommodations would be an undue hardship on business operations, the employer must provide a breastfeeding employee with reasonable accommodations upon request. The New Jersey Law Against Discrimination prohibits employees from being retaliated against for exercising their rights to reasonable breastfeeding accommodations or for opposing discriminatory practices of their employer. For example, an employee may have a claim if she is terminated in response to request that her employer provide breastfeeding accommodations or for complaining when a supervisor harasses the employee for needing to breastfeed at work. In addition to the New Jersey Law Against Discrimination, the Federal Affordable Care Act provides certain employee protections to express breastmilk at work. The Federal Affordable Care Act requires employers with 50 or more non-exempt employees to provide both suitable space and time for employees to express breastmilk until the child turns one (1) year of age. The U.S. Department of Labor is responsible for enforcing the Federal Affordable Care Act. It defines “suitable” place to pump milk as (1) a place to sit (2) an outlet to plug in a breast pump (3) a lockable door and (4) a space that is reasonably clean. Like New Jersey’s counterpart, an employer can be exempt from the Federal Affordable Care Act’s requirements if the employer can prove that providing pumping accommodations would pose an undue hardship on business operations. Returning to work after the birth of a child is difficult enough. Adding the stress of where, when and how long you will be permitted to express breastmilk adds additional stress. If you need advice or counsel regarding breastfeeding and breastmilk expression at work please contact our New Jersey Employment Lawyers at Smith Eibeler.